I'm continuing with my "bird theme" for the month of March. I've noticed it's difficult to narrow down my favourite bird-related picture books. There are so many of them! I spent a long time studying the stunning illustrations in this one. Behind Sami, the Syrian skyline is full of smoke. The boy follows his family and all his neighbours in a long line, as they trudge through the sands and hills to escape the bombs that have destroyed their homes. But all Sami can think of is his pet pigeons—will they escape too? When they reach a refugee camp and are safe at last, everyone settles into the tent city. But though the children start to play and go to school again, Sami can’t join in. When he is given paper and paint, all he can do is smear his painting with black. He can’t forget his birds and what his family has left behind. 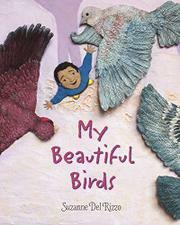 My Beautiful Birds was written and illustrated by Suzanne Del Rizzo. It was published by Pajama Press in 2017. The ground rumbles beneath my slippers as I walk. The story is told in a way that helps younger children connect to the feelings of sadness and fear of the refugee experience. The illustrations in this book are beautiful, reminding me of many amazing sunsets and cloud-filled skies I have experienced. sometimes I daydream that I hear them. This book is a great way to introduce or deepen an understanding of the refugee experience at the primary level. Some important aspects of this story for me were the strong sense of community through community members helping each other and the subtle hint of friendship at the end. It would be interesting to read this story along with Stepping Stones: A Refugee Family’s Journey by Magriet Ruurs & Nizar Ali Badr and compare the stories. Use modeling clay to create your own picture. Try blending clay and adding textures like the illustrator did for the illustrations in this story. Research: What is your favorite kind of bird? What is special about it? Discuss: What would you take if you had to leave your home forever? Draw a picture of your most important things. Sounds like a beautiful and heartbreaking book, but one that ends with some kind of hope. The part in the trailer where the pigeon gets blotted out by destruction is devastating. I adore Suzanne's work and can't wait to see these illustrations with all their texture. What a touching story. The illustrations really make this story stand out! Gorgeous book with an important story! I have been wanting a while to read this book. I have it on hold at my library. Apparently, I'm not first on the list. The story sounds quite moving.